As organizations take a close hard look at cloud computing and how it can help them with their businesses, some are coming away unimpressed by the maturity or with concerns about risk, control, and privacy. Yet others are beginning to notice that there a number of significant but previously unrelated threads in IT that are coming together to drive a compelling new cloud agenda. I’m calling this confluence of factors the “Enterprise Data Cloud”, and most organizations already have one, even if they aren’t aware of it. 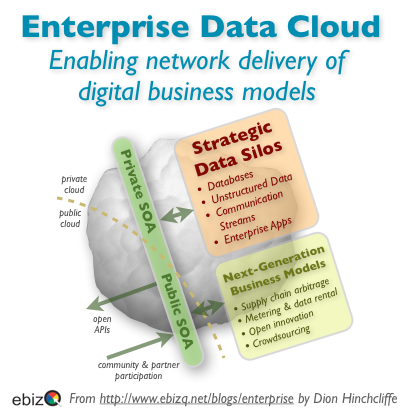 Increasingly open high-value business data typically delivered up via SOA. The rapid expansion of business information in machine-readable form. This last trend in data explosion is due to today’s digital enablement of practically all business artifacts. There has also been the associated rise of corporate social media (aka Enterprise 2.0), open APIs, and mashups. These three items in particular have done a great deal to actively encourage information to be opened, syndicated, and set loose within and across corporate walls, even if the impact is only now starting to be felt. The result is a rapidly emerging yet informal strategic cloud with ill-defined boundaries that is filled with much of the knowledge that a company possesses, at least most of it that is accessible. At the center of this cloud is highly structured information located in traditional silos like relational databases, file systems, or content management platforms and frequently made available via SOA or open APIs. This cloud also includes the landscape of more informal and less structured information in tools like e-mail, office productivity apps, and vertical apps as well as an intranet filled with portals, blogs, wikis, and social networks, both public and private. We’ve also entered a space in recent years where IT is often fragmented and becoming more localized and self-service, either to address the relatively poor performance of big-bang enterprise IT or take advantage of newer, more customizable approaches like SaaS and cloud computing. Strategic approaches to IT, like enterprise architecture, have begun to adjust in order to adapt to these new realities. Yet the Enterprise Data Cloud is forming on its own anyway, with each piece of new IT that is added, particularly when they are newer and more open systems. Last month I explored the concerns around modern IT approaches in depth with conversations by Tim Bray and Michael Krigsman, who noted that modern IT is continuing to underperform, while solutions using Web approaches are doing much better. I reaffirmed this in my recent examination of how cloud models may very well fix today’s often broken IT supply chain, yet we clearly have so much IT in place already. As a result, my premise has started to become that we might be actually be getting closer to many goals than we thought, even if it’s largely not intentional. If there is one thing I hear from SOA/EA architects out there is that it’s difficult to get the design, development, and deployment teams focused on the data. The real fun seems to be in the services and processes, and thus most work is concentrated there. The data, and integration strategies around the data, is something that most figure is there, will be there, and requires very little thinking and planning. From this and other datapoints it’s clear that there is an active disconnect between IT and data. In my opinion, this is one of the major causal factors in the all-too-common chasm between enterprise data and the business side in most organizations. Fortunately, some of us appear to be reaching a place that will actually help us address this issue.